Got an abundance of zucchini in your garden? 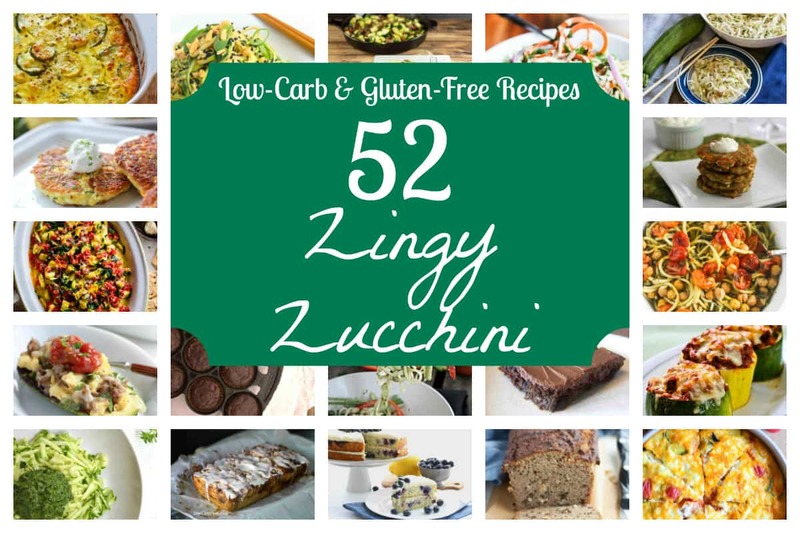 You are sure to find a new favorite recipe in this collection of 52 zingy low carb zucchini recipes. Here in New England, we enjoy an abundance of fresh garden vegetables in the summer. Zucchini is our favorite summer squash. Since we keep our diet low in carbs, I’ve gathered 52 low carb zucchini recipes to share. Zucchini is a wonderful vegetable to consume if you are looking to reduce weight. This is because it’s low in calories, but makes you feel full. Zucchini fills you up because it is high in water and fiber. So, eating low carb zucchini recipes are perfect for weight loss. You will get tons of nutritional benefit from consuming zucchini. It’s a good source of manganese. You’ll also get vitamin A, magnesium, folate, potassium, copper, and phosphorus from eating this popular summer veggie. It’s also has a high amount of omega-3 fatty acids. We hope that you enjoy this collection of low carb zucchini recipes to reap the benefits of this fantastic summer squash. What a fantastic roundup! Thank you so much for including some of my best zucchini recipes along with those of some of the best low carb bloggers on the internet!